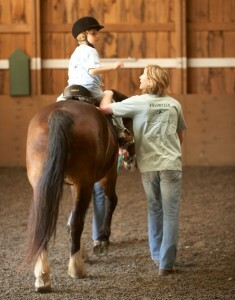 One of the many tasks that volunteers undertake at High Hopes is to side-walk horses while program participants ride. OLD LYME — There is a place in Old Lyme where people of all ages come together with a very special herd of therapeutic horses to improve the lives of people with physical, cognitive and emotional disabilities. On St. Patrick’s Day – Saturday, March 17 – between 10 a.m. and noon, the community is invited to join the staff at High Hopes to find out about a wide range of volunteering opportunities this spring and summer. At the Open House, classes will be running, and the volunteer team will be on hand to answer questions, discuss the types of volunteer jobs available, and create a schedule to suit you. 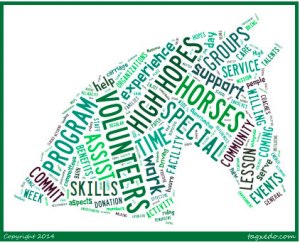 Over the course of a year High Hopes, an internationally recognized therapeutic riding and horsemanship center, relies on the help of over 650 volunteers to supplement its small staff and provide programs for a wide range of individuals and groups, as well as support its fundraising activities. Participants include children and adults with physical disabilities, veterans living with PTSD, children grieving the loss of a parent, families recovering from domestic violence and individuals and their families supporting a loved one with a life-long cognitive disability. High Hopes serves over 60 towns in Connecticut and beyond, works with 10 different school districts and a variety of different agencies from across the state. In the summer, High Hopes staff also provide an off-site program at Harkness Camp in Waterford. If your organization supports community activities and you would like to bring a group of volunteers to High Hopes for the day, the High Hopes volunteer team would also like to talk to you.